Deflect-o Interlocking Horizontal Tilt Bin - 4.50" x 23.63" x 3.63"
Modular unit with white frame and clear bins features a unique interlocking design that lets you mix, match and stack different sizes. 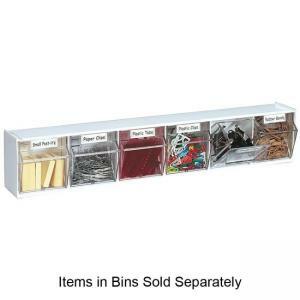 Mount bin storage system to a wall or place on a countertop. Bins tilt out, stay open, and then close again with the touch of a finger. Each bin can be easily removed from locking mechanism for easy cleaning or refilling. Tilt Bin Storage System includes mounting hardware and identification labels.